RIM has announced a new app today that will assist those who are blind or visually impaired to use their BlackBerry smartphone. 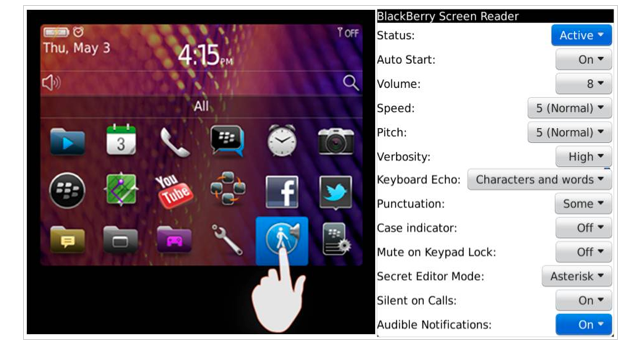 The BlackBerry Screen Reader app is free and currently compatible with the Curve 9350, 9360 and 9370. The Screen Reader app is available in English, French, Italian, German and Spanish and allows users to hear an audio version of select applications: email, calendar, phone calls, texts. In addition, the app is customizable and gives you the ability to set speech text-to-speech settings (volume, pitch and speech rate) and keyboard shortcuts.